Guides about evictions, foreclosures, and moving out. Caroline, a 73-year old retiree living on the western edge of Humboldt Park, is so grateful for MTO’s new Eviction Prevention Collaboration. Caroline lives on Social Security. On the third Wednesday of each month, she receives her SSI check and pays her rent. Unfortunately, Caroline ended up in the hospital recently and suddenly couldn’t pay the rent. Caroline informed her landlord that the rent was going to be late. The landlord agreed and told Caroline could pay the late rent in installments. When Caroline went to make her next payment, the landlord suddenly refused the rent and gave her a 30-day notice to vacate her home of the past 5 years by the end of December. The landlord further threatened her by telling her she was going to start showing the unit the very next day. Frantic and not knowing what to do, Caroline called MTO’s Eviction Prevention Collaboration. MTO’s case manager suggested that she talk with the landlord before writing a letter. The landlord said no, and told her to just “get out.” With help from MTO’s case manager, Caroline wrote a letter which reiterated the verbal agreement between they had made. The landlord did not respond to the letter. The case manager suggested she write one more letter and try paying rent when her next check arrives. This time the landlord accepted the rent. Caroline was ecstatic. There would be no court case. The sheriff would not be coming to her home. She would still have a home after the holidays. You can make sure that Caroline and others like her continue to have a home by donating to MTO. Every year there are more than 25,000 evictions filed in Cook County. Many more are evicted outside of the court system. Thousands of tenants are displaced. Their lives disrupted. Their communities destabilized. With your financial help, MTO can help stop evictions. Donate now. What is the Keep Chicago Renting Ordinance? The City of Chicago enacted the Protecting Tenants in Foreclosed Rental Property Ordinance, commonly known as the Keep Chicago Renting Ordinance (KCRO), in response to the harmful effect of the mortgage foreclosure crisis on renters in Chicago. The ordinance aims to keep renters in their homes by requiring new building owners to offer bonafide tenants a lease renewal or $10,600 in relocation assistance. You can view the full text of the ordinance by scrolling down or clicking here. The Ordinance requires that the notice be given in English, Spanish, Polish and Chinese. The Lawyers’ Committee for Better Housing (LCBH) has translated the notice and those translations may be used by owners to inform their tenants in accordance with the law. The notices can be downloaded by clicking here. Until the owner serves notice under § 5-14-040, the owner cannot collect rent or terminate a tenant’s lease for failure to pay rent. Chicago Municipal Code, § 5-14-040(c). pay the tenants a relocation fee of $10,600 within seven days of the Qualified Tenant vacating the unit. Chicago Municipal Code, § 5-14-050(a). If the owner elects to offer a lease, the owner must continue to offer renewals or extensions (with rent increases of no more than 2% per year) until the owner sells the property to a “bona fide third-party purchaser.” Chicago Municipal Code, § 5-14-050(g). What Tenants Are Entitled to Protections Under the Ordinance? The rent required under the lease or tenancy is not substantially less than fair market or is subsidized by the government. Chicago Municipal Code, § 5-14-020. In other words, leases entered into with children, parents, or the spouse of the former owner; leases where both parties did not negotiate in their own best interest; and leases with substantially less than fair market rent are not considered bona fide, and tenants without bona fide leases are not qualified tenants under the Ordinance. Which Property Owners Are Subject to the Ordinance? mortgagees that acquire ownership of a property through foreclosure or a deed in lieu of foreclosure. Chicago Municipal Code, § 5-14-020. Which Property Owners Are Not Subject to the Ordinance? a bona fide not-for-profit in existence continuously for a period of five years immediately prior to becoming the owner of the rental unit and whose purpose is to provide financing for the purchase or rehabilitation of affordable housing. Chicago Municipal Code, § 5-14-030. If an owner fails to comply with § 5-14-050 (Tenant relocation assistance), the qualified tenant shall be awarded damages in an amount equal to two times the relocation assistance fee. Chicago Municipal Code, § 5-14-050(f). Penalties for violation of the KCRO are significant enough that LCBH expects substantial compliance. NEED ASSISTANCE? Call the LCBH’s free Tenants in Foreclosure Help Line: 312-784-3507 or call our free Tenants Rights Hotline, Monday-Friday between 1:00pm – 5:00pm: 773-292-4988. To find out if your building is in foreclosure, click here and follow the step-by-step instructions. Section 1. Title, Purpose and Scope. This chapter shall be known and may be cited as the “Keep Chicago Renting” ordinance and shall be liberally construed and applied to promote its purposes and policies. It is the purpose of this ordinance, in order to protect, maintain, and improve foreclosed rental property, preserve rental housing stock, mitigate losses to area property values, and avoid neighborhood destabilization due to foreclosure, to prevent vacant foreclosed residential buildings and preserve tenancies in these properties. Except when this ordinance conflicts with the statutory or regulatory provisions governing federal housing subsidy programs, including, but not limited to, public housing and project-based Section 8 housing operating pursuant to 42 U.S.C. § 1437 et seq., the provisions of this ordinance shall apply to and regulate ei;er3′ foreclosed property in which occupants hold possession of dwelling units. The rights, obligations and remedies established by this ordinance shall be cumulative and in addition to any others available at law or in equity. Nothing in this ordinance shall affect a landlord’s obligation to provide notice of termination of tenancy as required under applicable laws governing actions for possession. (a) “Dwelling unit” means a structure or the part of a structure used as a home, residence or sleeping place by one or more persons who maintain a household, together with the common areas, land and appurtenant buildings thereto, and all housing services, privileges, furnishings and facilities supplied in connection with the use or occupancy thereof, including garage and parking facilities; except that this ordinance shall not govern dwelling units described in Subsections 5-12-020 (b) and, (c) of this Code. (b) “Foreclosed property” means any property for which legal and equitable interests in real estate were terminated by a foreclosure action brought under the Illinois Mortgage Foreclosure Law (“IMFL”), 735 ILCS 5/15-1101 et seq. (c) “Foreclosing owner” means a person or entity, or an agent acting on behalf of a person or entity that holds title in any capacity, directly or indirectly, to a foreclosed property and either (1) was a mortgagee who was a party to the foreclosure or is the subsidiary, parent, trustee, nominee or agent; or (2) is the Federal National Mortgage Association or the Federal Home Loan Mortgage Corporation. (d) “Occupant” means any person in lawful physical possession of a dwelling unit in all or part of a foreclosed property and as described under Sections 1223 and 1508.5 ofthe IMFL. (e) “Tenant” means a person entitled by written or oral agreement, subtenancy approved by the landlord or by sufferance to occupy a dwelling unit to the exclusion of others, as defined by the Chicago Residential Landlord Tenant Ordinance (“RLTO”) in Section 5-12-030 of this Code. Section 3. Eviction of Occupants Prevented; Exceptions. A foreclosing owner may not maintain an action for possession, except in accordance with this ordinance or unless a binding purchase and sale agreement has been executed and is in effect for the purchase of the dwelling unit by a bona fide third party purchaser. Within 21 days of taking title to foreclosed property, a foreclosing owner must notify in writing all occupants of dwelling units of the real estate using the text provided in subsection (d) of this section. This notice must be printed in English and Spanish in no less than 14 point type, on paper at least eight and one-half inches by 11 inches in size. (a) Service requirements shall be satisfied i f the foreclosing owner has (i) posted this notice in a prominent location in the building; (ii) mailed this notice by first class mail to each unit; and (iii) has made an attempt to personally serve an occupant of each unit in the building. (b) The Commissioner of the Department of Housing and Economic Development (DHED) shall make available for distribution, both in print and in an easily printable format on the department’s Internet website, the following notice in English with a Spanish translation that may be used to satisfy the notice requirements of this section. (c) Compliance and Curing Noncompliance. For purposes of collecting rent or maintaining an action for possession as described in Section 5, a foreclosing owner may cure a failure to timely provide notice by providing the notice more than 21 days after the transfer of title. Curing the notice deficiency, however, shall not waive any occupant’s right to remedies as described in Section 8 of this ordinance. Additionally, a foreclosing owner shall have no right to collect back rent that accrued during the period of time that the foreclosing owner was not in compliance with the notice requirements of this section. City of Chicago law requires that we provide you this notice informing you of your rights as occupants of [INSERT PROPERTY ADDRESS]. This property is now owned by [INSERT NAME OF FORECLOSING OWNER]. The former owner of this property no longer owns the property because the property was foreclosed. Chicago law protects your right to remain in your home after a foreclosure. [NAME OF ORDINANCE AND CITATION]. This law protects all occupants, even if you do not have a written lease. The law states that you cannot be evicted just because your building was foreclosed. You do not have to pay the new owner any rent owed before the due date provided in this notice. 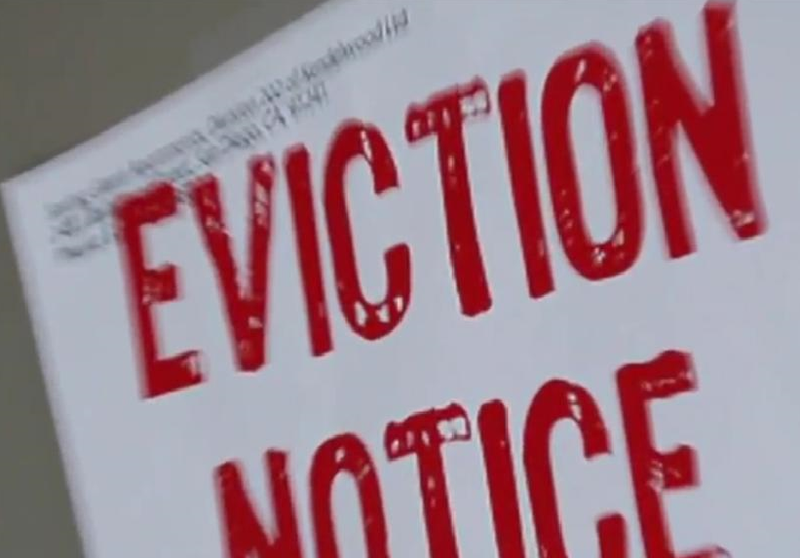 You can only be evicted if you do not pay rent starting on the due date provided in this notice, if you commit a crime or allow someone you know commit a crime in your home, if you damage your home, or if you refuse to let the new owner inspect your home and make necessary repairs. You can only be evicted after the new owner of this building files an eviction claim in court and you are given a chance to defend yourself in front of a judge. You can only be removed from your home by personnel of the Cook County Sheriffs office with an order from the court. Your rent cannot be raised unless the new owner of this building files in court and you have had a chance to defend your current rent in front of a judge. The former owner of this building has no right to collect rent since the former owner does not own the building anymore. You should now pay your rent to the new owner of this building: [INSERT NAME, ADDRESS, AND TELEPHONE CONTACT INFORMATION OF THE FORECLOSING OWNER, THE BUILDING MANAGER, OR OTHER REPRESENTATIVE OF THE FORECLOSURE OWNER RESPONSIBLE FOR COLLECTING RENT]. Please pay your rent on the [INSERT DAY] of each month by [INSERT METHOD OF TRANSMISSION]. You are not responsible for paying any back rent owed prior to the due date provided in this notice. The new owner of this building must maintain the property including making sure the building and your unit are safe and secure, removing trash and debris, and exterminating any vermin. The owner must also make sure that heat, running water, hot water, electricity, gas and plumbing services are all available. For maintenance issues and emergencies, please contact [INSERT NAME, ADDRESS, AND TELEPHONE CONTACT INFORMATION OF THE FORECLOSING OWNER, THE BUILDING MANAGER, OR OTHER REPRESENTATIVE OF THE FORECLOSURE OWNER RESPONSIBLE FOR COLLECTING RENT]. If you do choose to move, you are entitled to collect your security deposit from the new owner of this building. If the new owner of this building tries to evict you, raise your rent, refuses to return your security deposit, or fails to maintain your building, you may be eligible to collect damages. Please contact a lawyer, a legal aid or housing counseling agency, or the Coordinated Advice & Referral Program for Legal Services (CARPLS) legal aid hotline at (312) 738-9200 to discuss your rights. Section 5. Right to Possession. (d) thirty days have passed, an occupant’s bona fide lease or other rental agreement has terminated, and the foreclosing owner, by written request, has offered a lease under the same terms that were in effect at the time that the foreclosing owner took title, and the occupant has rejected that offer. Section 6. Increase of Rent. without leave of court. The court may allow an increase of rent if, in an action brought by a foreclosing owner, the court finds by a preponderance of the evidence that the current rent is below market rate and an increase of rent is necessary to operate, manage, and conserve the dwelling unit. In the event that the foreclosing owner and an occupant of a dwelling unit agree to a rent increase for that dwelling unit, the foreclosing owner is excused from the requirements of this section as to that dwelling unit. Nothing in this section shall alter the terms of any lease agreement. Section 7. Misrepresentation of Right to Possession. (c) to interrupt occupancy as defined under Section 5-12-160 of this Code, except that this ordinance shall also prohibit actions taken against occupants. Section 8. Defenses and Remedies. First, you must find out the Property Identification Number (PIN) of your building. Online, you can try www.newschicago.org. If the website is down or it is not finding your building, you can call the Cook County Assessor’s office at 312-443-7550. Once you have the PIN number, you can go to the Cook County Recorder of Deeds’ website and click the link to do a “Property Identification Number (PIN) Search.” This page can get a bit confusing, so a phone call to their office is a good alternative at 312-603-5050. You can also find out the landlord’s name by going downtown. Begin your search in County Building (118 N. Clark Street). First go to the Revenue Dept., Room 112, and ask someone at the counter for the Permanent Index Number (PIN number) for the address of the building. You may also get the PIN number yourself by looking at the green books on the counter. Go to the tract dept. of the Recorder of Deeds which is located in Room 120. Give the person at the counter the PIN number and tell them that you want to know the name of the owner of that building. The grantee of the most recent deed recorded is the owner of the property. If the property is in a land trust you can send letter to the bank trustee. They should forward the letter to the beneficiary of the trust your landlord. The bank will not disclose the name of the beneficiary of the trust to you. Get the document number of the deed (see below). Take the document number of the deed to the microfiche department in the Recorders Office, down the hall from the Tract Dept. Tell the person behind the counter you want to look at the deed to determine the grantee’s address. Give him the document number. Look at the deed for the grantee’s address, usually near the beginning. This is the landlord’s address at the time he/she purchased the building. The address could be near the bottom under “send subsequent tax bills to”. If it is a corporation, call the Secretary of State at 312-793-3380 to get the name of the registered agent and corporation’s address. Call the Revenue Dept. 312-443-5100 or 443-6253 to find out the property taxpayer’s name. Caution – the taxpayer is not necessarily the owner, it could be the previous one. You can also get this info in Room 112. If you have the landlord’s phone number, call Ameritech’s Reverse Directory at 312-796-9600. They will give you the address if the number is listed. Call the City’s Dept. of Buildings Multiple Dwelling Registration number 312-744-3452. All apartment buildings should be registered. They can give you the name and address of the landlord or landlord’s agent. However, few buildings are registered even though failure to register is a building code violation. You can check to see if your landlord is being sued (defendant) by calling the three numbers listed below. (Or use the computers in room 602 of the Daley Center 50 W. Washington Street. Type “users” to get to the main menu.) If he/she is, get the case number. Then go to the appropriate floor at the Daley Center and look at the file (see below for the location of the different departments). The address where the landlord was served should be on the summons.